These three drawings are not dated or well-annotated, so it's a little hard for me to remember exactly when they are from and for what reason they were created. 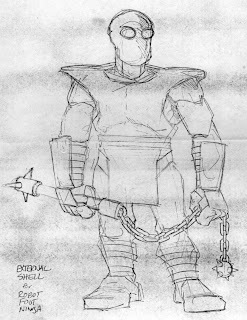 But I probably did them in the first decade of TMNT. BTW, Pete, 4kids has begun 'leaking' images and short audio for the DTV movie. 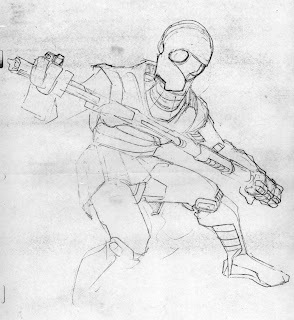 Thank you for not changing the designs of the OT Turtles and characters. I was a little worried about that considering the look of Turtles in Time ReShelled. I can't help but wonder if, as far as the voices go, we're being set up for something cool...though :). That's cool! And did you hear the rumors about a real modern day ninja clan operating in NYC? I swear it sounds just like the Foot! You can't find out a lot about it yet but go to the blog nycninjawatch.blogspot.com if you're interested. Pretty neat even if it is just a hoax. -->>Amic is right, there is an Exo suit from the Oots there !! Maybe Saki's bots were other worldly rip offs !! What was the inspiration for the Foot ninja's big-eyed mask? Interesting. 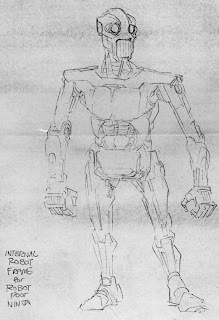 Vaguely resembles the Utrom endoskeletons. hey can you make me some art that i can add to my tmnt tattoos? i only have all 4 on my arms and they are not small. Probably that was one of the things that really grated on me-- those robot ninjas. It was the times, I know-- there could be "death" as long as they were machines, not people. Very cool Robot foot. I always liked the idea of Shredder being short on finding human ninjas (with the training and whatnot being a lot of work) and having to settle for a larger legion of robot Foot. I realize that there is no Mirage precident for this, but it's how I sort of imagined it in my head.